Keratitis is an eye condition that involves the inflammation of the cornea, which is the circular portion in front of the eyeballs. Its symptoms include blurry vision, bloodshot eyes and extreme sensitivity to light. There are different types of keratitis, which include superficial keratitis, traumatic keratitis and herpes simplex viral keratitis. 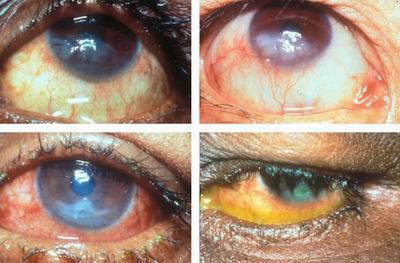 Superficial punctate keratitis is usually experienced when the cells on the surface of the eye’s cornea start to die. Herpes simplex viral keratitis is caused by the herpes virus, a sexually transmitted disease. Meanwhile, traumatic keratitis usually occurs when the injury leaves a scar tissue on the eye’s cornea. The common causes of keratitis are events that often lead to the inflammation of the cornea. Some of its common causes include fungal, bacterial or viral infections, overexposure to ultraviolet light from the sunlight, and extremely dry eyes caused by an abnormal rate of tear formation. People who excessively use their contact lenses are also susceptible to the inflammation of the cornea. The cornea would also be inflamed upon the accidental insertion of foreign objects in the eyes. Harmful agents from pollution, dust, pollen, and other airborne particles could also irritate and cause the eye’s cornea to become inflamed. Sometimes, a deficiency in Vitamin A could also lead to the various types of keratitis. People who have developed keratitis are usually faced with the problem of extreme sensitivity to light. Even brief exposure to sunlight would increase the pain that sufferers of keratitis feel. Some of its obvious symptoms also include bloodshot, painful and teary eyes as well as blurred or hazy eye vision. Keratitis is cured depending on the main problem that triggered the inflammation of the cornea. If a particular virus is at fault, this eye condition usually clears up on its own without any need for medication. Two to three weeks is enough time for the cornea to heal due to a viral infection. People who want to speed up their recovery could also use antiviral eye drops and ointments. Meanwhile, if the cornea’s inflammation is caused by a bacterial infection, antibacterial eye drops are usually used to cure it. These eye drops are also used if the keratitis is caused by irritation from the excessive use of contact lenses or exposure to ultraviolet light. An eye drop solution is also used together with the antibacterial drops in order to combat dry eyes and increase tear formation. Sometimes, doctors also swab the eyes or scrape the damaged cells from the cornea. Eye patches are also used to prevent light from causing further eye irritation and painkillers are used to alleviate the pain felt due to the cornea’s inflammation. Keratitis usually poses temporary risks or total blindness in some cases. However, majority of people who have experienced it usually completely recover from it after following the prescriptions of their doctors. Sometimes, people who experience visual impairment due to keratitis also choose to undergo surgery or corneal transplants in order to correct their eye conditions. Now that you are already aware of the common symptoms and causes of keratitis, you would know exactly how to react once you experience its first few symptoms and signs.